Stuff Points: Earn 135 points when you buy this stuff. Store and organize everyone's gear in one compact location. Instead of balls and sticks lying all over your garage, this durable storage rack will allow you to hang them in a single convenient location. It is versatile enough to handle almost any equipment you have, and it is durable enough to hold up to 200 lbs, and last a lifetime. 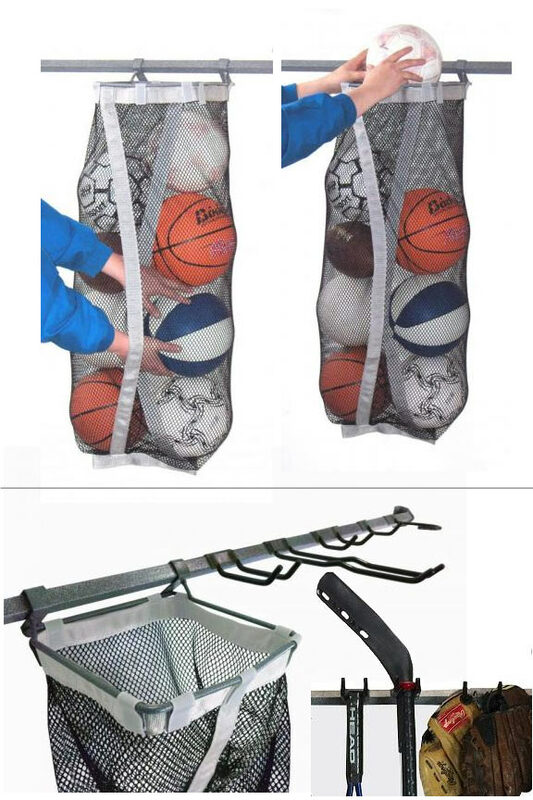 It comes with a variety of hooks to accommodate the assortment of equipment that is common for busy families and avid sports enthusiasts, and it even comes complete with a large bag to hold up to ten full sized balls. When you store your hockey sticks, helmets and pads on this device, it will take up less room, and it will remain better protected when you're not using it. This results in more usable space in your garage, basement or shed, and it ensures a longer life for your equipment because it will be protected from damage and breakage. Don't just lean things against the wall, or toss them on the floor. Make it easy to find what you need without digging, and eliminate the possibility of stepping on it before you find it. This large Sports Storage Rack from Monkey Bars is the perfect addition to any garage, and will make it easy to reduce clutter while giving your expensive sporting goods a home. Stronger and more versatile than almost any other option out there, this amazing rack can hold a wide variety of gear. It comes complete with an assortment of hooks that easily attach to the main bar, and then slide into any position that works for you. It even has a large mesh bag to hold all of your basketballs and soccer balls. Toss any full size ball into the top opening, and the tall, mesh bag will hold them securely. A large opening in the front allows for quick and easy retrieval whenever you want to play. All of the hooks are made from steel, and then coated in a rubbery plastic in order to increase grip while decreasing the possibility of damage. Use the "j" hook to hang a bike, store a bag of golf clubs or hold pads and other equipment. The five inch double hook is perfect for supporting any type of racket, but can also be used as a regular hook to hang just about anything else. The twelve inch hook is a long double hook that you can use for baseball bats and hockey sticks, and they will gently dangle while being securely supported without making them difficult to retrieve. The three inch wide hook is great for baseball mitts and helmets, but can also be used for football pads and other gear as well. Use the remaining single hook to hang bags of equipment, helmets or anything else that features some sort of loop or strap. 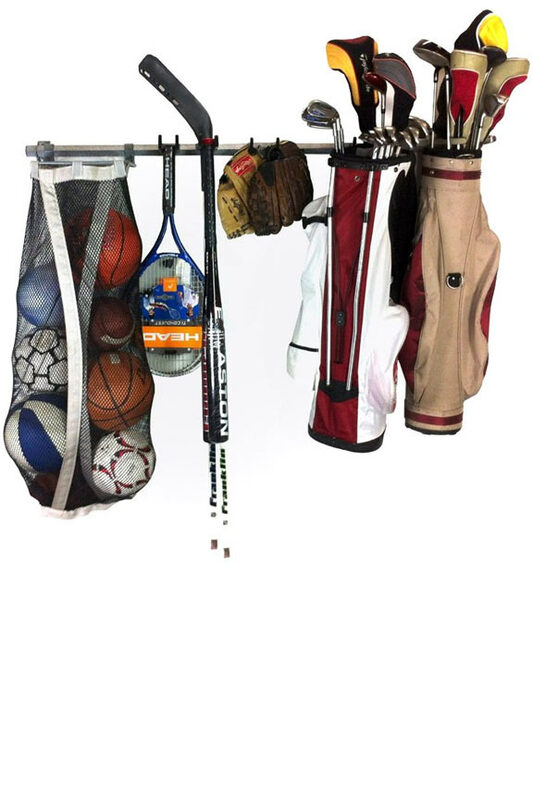 With this versatile combination, and your ability to place each hook right where you want it, this storage rack offers one of the best ways to secure and organize any sports equipment. Installing this sturdy rack is easy, and most people will have it ready to go in under fifteen minutes. The most important part of the mounting process is to locate the ideal spot. You will want to make sure you place it in a convenient location, but you also need to make sure that the brackets are secured to a stud or something else sturdy. The entire job consists of mounting the brackets, adding on the bar, and then attaching the hooks and bag. Use a stud finder to locate the position for the first bracket, and then mark where the holes are by using the bracket as a guide. Now, set the bracket down and then drill guide holes where your marks are. Do the same thing for the one on the other side, and then secure them both in place by driving the included screws into the wall. Make sure to check that it is level before inserting the bar, and then simply press down on the metal tab to slip it in. Once through the hole in the bracket, the button will pop back up to lock the bar in place. After you have the bar securely mounted simply attach the hooks, and move them into position. Once all the hooks have been added, start piling on your equipment in order to sort and straighten it right on the wall. Everything will be held in place, and it will be perfectly separated. Your bats and clubs will be easy to locate and quick to retrieve. Stop kicking stuff around to find what you are looking for, and don't spend another minute frustrated over damage that came about due to improper storage. When your equipment is safe and secure when not in use, it will be easier to find when you need it, and it will be less likely to get ruined when you don't. The area you are using now will be more clean as you free up space, reduce clutter, and eliminate unwanted piles of equipment. You will get tight storage similar to a closet, but everything will remain visible and protected due to specific spots for specific equipment, and fool-proof organization that occurs just by placing things where they belong. The durable set comes with every piece of hardware necessary for installation, and a lifetime warranty from the manufacturer. Take a few minutes to install this in your garage, and you will have an incredibly useful unit that will last longer than any of the stuff that you intend to hang on it. Order Yours Today! 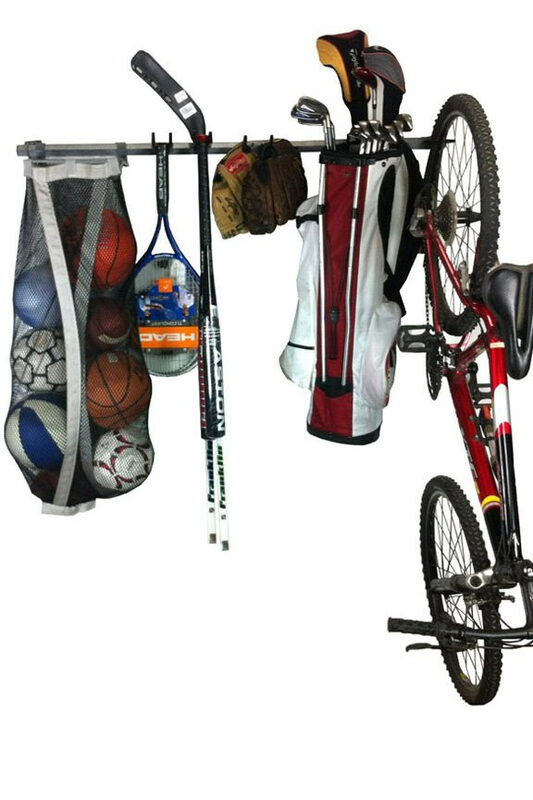 Uses Neatly organize all of your sports equipment on one convenient rack. A variety of hooks, and a large bag allow you to hang and store almost any kind of sporting good. Balls, bats, clubs, bikes, helmets, pads and more can all be accommodated. Compatibility Works with nearly any sporting equipment you own. Mix and match gear for amazing storage capabilities in a compact area. Hooks Included Comes with one "j" hook, one 3" single hook, one 3" wide hook, one 5" double hook, one 12" hook, and one large ball bag. Large Sports Storage Rack - Maximize capacity with this versatile storage rack. Gather up all of the gear spread across your garage, and store it in one compact location. Order Yours Today!